Water Oasis has gotten a WHOLE LOT bigger. Cool off in an oasis surrounded by palm trees nestled in the foothills of the Santa Cruz Mountains. Open May 3rd - September 22nd. Zoom down 3 new twisty slides- big enough even for Mom and Dad to try! With a combined slide path length of 384.4 feet- they're longer than a standard football field! Wait for it...this giant bucket of water counts down to a super splash. When time runs out- a waterfall of water is dumped onto everyone it's way. 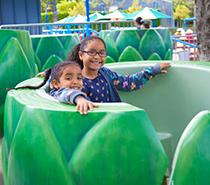 Chill out in the Lagoon wading pool, cool off underneath giant spraying flowers at the Splashpad, and discover the Water Journey where even the youngest children can learn and direct the flow of water with levers to learn how water flows from the hills, down streams to the ocean. Glassware and similar material with a tendency to shatter on impact are not permitted in Water Oasis. For safety reasons, diving is not permitted in the Lagoon. 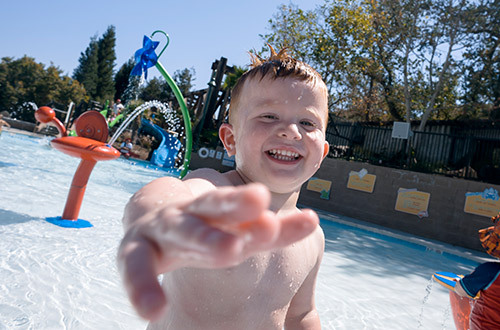 Water Oasis and Gilroy Gardens are smoke-free environments. Smoking is only permitted outside the park. Cameras, cell phones and video recording devices may not be used on any slide or in any changing area or restroom. Masks and snorkels are not permitted in the Lagoon. According to crowd size, time at the water attractions and access to Water Oasis may be limited. Guests wearing bathing attire with metal buttons, rivets, zippers, or snaps will not be permitted to use the slides. 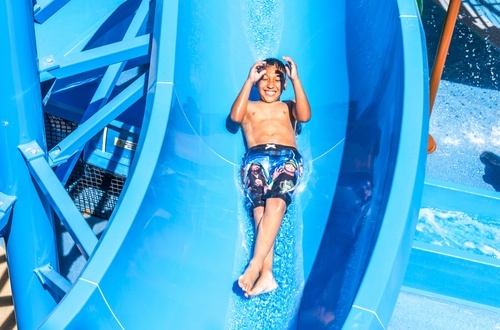 Aqua socks and aquatic style footwear are the only footwear permitted in the lagoon and on the slides. When exiting Water Oasis, shirts, shorts, and shoes are required. Children’s’ swimsuits and other aquatic gear can be purchased at Oasis Cabana Cart. In an effort to provide a safe and enjoyable water park experience for our guests, Water Oasis routinely utilizes training exercises to improve our lifeguards’ skills and vigilance. These exercises will occur during normal operating hours and may consist of the following: submersible water mannequins, the use of video surveillance equipment, internal and external audits, active/inactive water rescues and/or first aid scenarios. 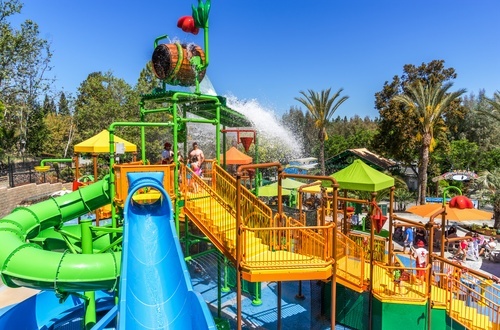 Water Oasis provides a full day of fun in the sun! To make the most of your day, be sure to drink plenty of water in order to avoid heat exhaustion. Drinking fountains are located near each restroom. Don’t forget to apply sunscreen frequently throughout the day. If you happen to forget your sunscreen, Oasis Cabana Cart and various merchandise locations throughout the Park have a variety of sunscreens and sundries available for purchase. 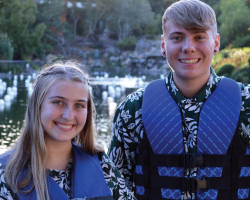 Life jackets are available for use throughout Water Oasis. Life jackets are complimentary and are available to any guest wishing to use one. Children, first-time swimmers, and weaker swimmers are encouraged to wear a life jacket. Life jackets are available for all guests needing special consideration. Some attractions require children below a specific height to wear a life jacket before participating in the attraction. Aquatics staff and lifeguards reserve the right to impose the use of life jackets as needed. For specific attraction requirements, please visit our Water Features page. Guests are permitted to wear their own life jacket; however it must be Coast Guard certified. The First Aid Station is located behind Monarch Garden. If you need any assistance during your visit, do not hesitate to stop by the First Aid Station, or notify the nearest lifeguard. Our team will be glad to assist. Upon arriving, we recommend selecting a meeting place such as the Welcome Center, in the event you or your child becomes lost or separated from your party. In the unlikely event that your child becomes separated, please alert an associate. Public address pages cannot be broadcast inside Gilroy Gardens. If you happen to lose an item or leave an item behind while visiting, please drop by the Welcome Center during regular operating hours. After hours, please visit Guest Services located at the front entrance of the Park. 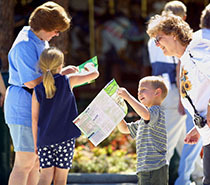 Gilroy Gardens is committed to providing all of our guests with an enjoyable visit. 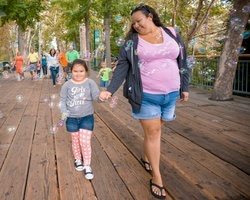 Guests with disabilities are encouraged to visit our Guests with Disabilities page for detailed information on the requirements of each attraction, along with the programs that Gilroy Gardens and Water Oasis offer. For your convenience, lockers are located next to the changing rooms. Various locker sizes are available for all of your personal belongings. Locker rentals are automated and can be paid using cash and credit cards. Debit cards cannot be used at this time. The lockers work with electronic pin codes and will allow unlimited access throughout the day. Locker access is available until both Water Oasis and Gilroy Gardens are closed for the evening. Gilroy Gardens cannot be held responsible for lost or stolen items. May I bring in food for my child or a picnic for my family? Q: What food and drink can I bring into the Park for my child? A: We respect that some guests are too young to eat anything not prepared at home. Baby food, toddler snacks and water are always allowed. Please restrict your toddler snacks to one snack bag per child. Q: Can we bring a picnic lunch? 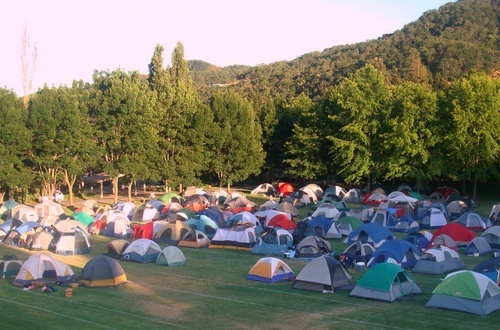 A: Yes, out of courtesy to our vendors we ask that you use the picnic areas conveniently located outside the Front Gate. Q: My child or family member has a special diet—may I bring in their food? A: We do not discriminate for any dietary need: medical, religious or personal choice. Out of courtesy to all of our guests we ask that outside food remain in the picnic areas located outside the Front Gate. Q: Does Gilroy Gardens provide vegan, gluten-free, whole food and fresh food options? A: We have a wide variety of options and pride ourselves in fresh food made to order in many locations. -Uncle John's BBQ serves Corn on the Cob—fresh off the grill!